According to an article on ScrapFriends, photographs kept in albums more than 10 years old show visible signs of acid deterioration. This is due to the fact that the type of paper, adhesive and protective sheets are non-archival. Modern-day scrapbooks and photo albums often have labels reading “Acid-free,” which means the materials are archival and will not damage your treasured photographs. In order to transfer photographs from old albums, they must first be removed. There are a few different ways to do this. These processes take a lot of patience as well as a backup plan. Scan your photographs into a computer as a backup before attempting to remove them from the album. Photographs often are torn, bent or completely destroyed when attempting to remove them from very tacky adhesive. Although a scanned image is not the original, at least you will be able to keep a copy if the original suffers damage. Begin with the most unessential photograph first, according to ScrapFriends. This could be a photograph for which you have the negative or one you are not planning to archive. Hold a piece of dental floss taut and slide it underneath one corner of the photograph. Move the dental floss in a back-and-forth motion, pulling down with gentle pressure until the photograph separates form the adhesive. 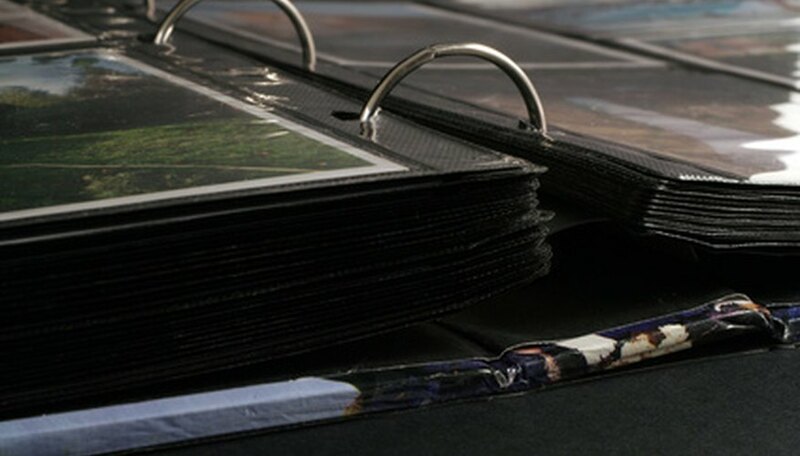 Select a page of the album where photographs are stuck to only one side. Set a hair dryer to “Warm” and the lowest air flow setting. Blow warm air onto the back of the page to soften the glue, then slide a small, metal palette knife under one corner to remove the photo--or use the dental floss technique to remove the photograph. Place an album page in a microwave for five seconds, then check the softness of the glue. Repeat this until the glue is soft enough to pull the photograph from the page. Use a the palette knife or dental floss technique to remove the photograph. Do not place album sheets with metal into a microwave. Wrap the album page in a layer of plastic wrap and place it in the freezer for about five minutes. This will make the glue brittle. Immediately pull the photograph from the page using the palette knife or dental floss technique. Do not let the frozen page sit, as condensation will damage the photo. Have a trained conservator remove irreplaceable photographs like daguerreotypes or very old photos for which you don't have the negatives. The National Archives: Should I Remove My Photographs from Old Albums, Such as Black Paper Albums or Self-Stick Albums?